I have bad news for lovers of sushi and sashimi. Early in 2017, North Pacific salmon was found to be infected with Diphyllobothrium nihonkaiense, by the CDC. Diphyllobothrium nihonkaiense is the scientific name for a broad tapeworm previously known to infect only Asian Pacific salmon. This parasite recently hit the spotlight in a major way. In Fresno, California, a man found a 5 and a half foot long specimen in his stool. For the previous few months, he had felt something moving around in his abdomen, but had assumed it was just gas. 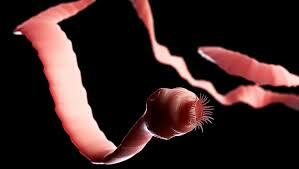 After a strange and bloody bowel movement that frightened him, the long tapeworm came wriggling out. He wound it around an empty toilet paper roll as evidence, and then brought himself to the hospital emergency room, where the amazed doctors prescribed him anti-parasite medication normally prescribed for pets. How was this man infected? Doctors suspect he ingested the tapeworm while eating raw salmon sashimi, which he admitted eating almost every day for lunch. Although a five and a half foot long tapeworm may seem outrageously long, the U.S. Centres for Disease Control and Prevention say this parasite can grow up to 30 feet long in a human body. Worried about your own raw fish consumption? It helps to add some wasabi paste, or ginger slices to your slice of sushi before eating it. There is a reason these condiments are provided with every sushi meal. The spiciness of the wasabi, in particular, can help to kill any parasites present in raw fish before they can take hold in your body. Additionally, if you plan to eat uncooked fish in your own home, freezing it for two days will also kill the parasite. Of course, cooking will also kill off any parasitic infection. If you have concerns that you may already be infected, herbs such as black walnut or wormwood have anti-parasitic properties, and can be taken daily in tincture form to help kill off any parasites in your body. Check your local health food store for a good source. Common symptoms of a parasite infection include abdominal pain, diarrhea, unexplained weight loss, and a deficiency in B12. But sometimes, there are no symptoms. For those who are concerned, maybe it’s time to limit your consumption of raw fish – particularly salmon. I myself I’ve never been very comfortable with it, and with this parasite now entering North American waters, I think it’s wise to be more cautious.